For the 2017-18 school year, Idle-Free California Inc. implemented Sacramento County Idle-Free Schools, a long term, student-led study and campaign that addressed the issue of prolonged idling of vehicles on school grounds. Outside of this project, this California Idle-Free Schools (CIFS) webpage is a RESOURCE for any teacher of any school on implementing an idle-free schools campaign and/or idle-free classroom presentations on their own. Why an idle-free schools project? The goal to eliminate idling on school grounds (and beyond) is a real win-win. Not only do motorists save money in avoiding needless fuel consumption and engine wear, carbon emissions are reduced, energy is conserved, and, most importantly, our health — particularly of students — is protected. The U.S. EPA states: "Idling vehicles contribute to air pollution and emit air toxins, which are pollutants known or suspected to cause cancer or other serious health effects. Monitoring at schools has shown elevated levels of benzene, formaldehyde, acetaldehyde and other air toxics during the afternoon hour coinciding with parents picking up their children. Children’s lungs are still developing, and when they are exposed to elevated levels of these pollutants, children have an increased risk of developing asthma, respiratory problems and other adverse health effects. Limiting a vehicle’s idling time can dramatically reduce these pollutants and children’s exposure to them." Idle-Free Schools campaigns address the issue of idling “hot spots” at many schools, for instance when parents pick up students in afternoon pick up areas (California regulates the idling of school buses and other heavy-duty vehicles at or near schools; light-duty vehicles are not regulated). A CIFS project is tailored for middle school* science, math, STEM, health, and environmental teachers and their students to conduct idle-free campaigns. The presentation resources below include a 40-45 minute PowerPoint and videos explaining what idling is, the benefits in avoiding it, and campaign steps, along with handouts for students and teacher toolkit. These campaigns are offered in two levels of commitment: long-term efforts and short-term efforts. A long-term effort is actually a measurable study and campaign combined. It can span part to most of a school year with a student-led study of unobtrusive data collection, schools announcing support of an idle-free campaign in the school community, a student-led driver contact event, and final data collection to determine a difference. A short-term effort is strictly a campaign. It is simpler and though not measurable, still effective in making a difference. It can span as little as one month with schools disseminating information in the school community on the benefits of avoiding idling, followed by a student-led driver contact event. PROJECT DETAILS AND RESOURCES BELOW. NOTE: Parents/parent clubs/PTOs are encouraged to participate! 1. students learn organizational, analytical and communication skills as they perform data analysis, are empowered by showing drivers the significant benefits in shutting off engines when parked, and take pride in making a positive difference in their school community. 2. motorists learning of the benefits potentially apply them beyond schools. To help sustain either of these efforts, schools or school districts in proceeding years are strongly encouraged to remind the school community about the benefits in idle reduction several times each year, and to consider adopting policies, procedures, or handbook rules that limit idling on school grounds. In addition to implementing the Sacramento County Idle-Free Schools project for the 2017-18 school year, Idle-Free California has also implemented funded Idle-Free Schools projects in the 2013-14, 2014-15, and 2015-16 school years in Vermont under the organization's former name of Idle-Free VT Inc. For details of these successful initiatives, please visit Vermont Idle-Free Schools Archive. *While middle school students are at the ideal age to conduct these campaigns, they can also be conducted by high school students or, with more staff input, 5th and 6th graders. The California Idle-Free Schools initiative includes resources below. Schools are welcome to download these resources, allowing teachers to implement these efforts on their own. • No Idling Signs: one or two 12" x 18" or 15" x 21"
Step 1: in fall or early winter, conduct initial training session in the classroom, including provision of campaign materials. Step 2*: in fall or early winter, students unobtrusively conduct four-day study of initial data collection of idling vehicles during afternoon dismissal, utilizing note-taking and timing devices. NOTE: It is essential that participating students begin their observations at least 15 minutes prior to official dismissal. Step 3: following initial study, school announces support for idle-free campaign in school community, including a notice in school newsletter and website, and optionally letter and pledge to parents and delivery companies. See "For school administrators" below for support resources. 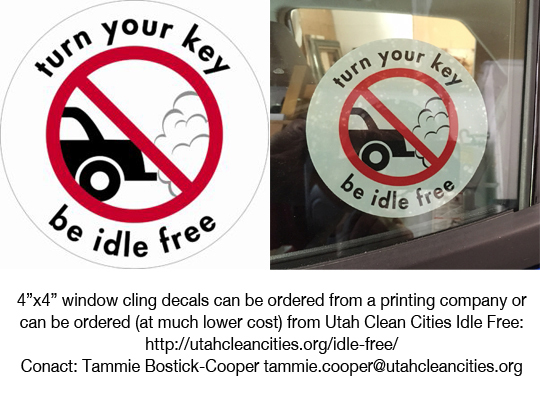 Step 4: in mid to late winter, students conduct two-day driver contact event, reaching out to idling drivers with information handout and idle-free window decal, asking them to take no-idling pledge. Campaigners create idle-free posters to display at event. SUGGESTION: seek TV, radio, print and/or social media coverage by working with school district's communications office. Step 5*: in early spring, Step 2 is repeated. The difference between before and after data collection is then calculated to determine a difference and the effects of student's educational efforts. *NOTE: to determine a true data set, it is important to conduct initial and final data collections in similar temperature ranges. Step 1: anytime before late winter, initial training session in the classroom. Step 2: following initial training session, school disseminates information in the school community on the benefits of avoiding idling; obtaining and installing no idling signs strongly recommended as above. Step 3: within two weeks, driver contact event as in Step 4 above. NOTE: To help gauge the success of our educational outreach, we at Idle-Free California would very much appreciate hearing from organizations or teachers that make use of this resource.